This is used as a node between Internet and the spresense. To power the whole system, I used an Anker PowerBank. A bridge between photon and Android app, not used in this Project due to shortage of time. For App development, I haven't used it for this project due to shortage of time. Used for App Development of this project. Moreover, there will be an android app for the people willing to help such people. So, whenever the SOS switch is turned on, the user will get an alert in his app. But which device packs all these features into a single board? Its the Sony Spresense! Integrated GPS - The embedded GNSS with support for GPS, QZSS and GLONASS enables applications where tracking is required. Hi-res audio output and multi mic inputs - Advanced 192kHz/24 bit audio codec and amplifier for audio output, and support for up to 8 mic input channels. Multicore microcontroller - Spresense is powered by Sony's CXD5602 microcontroller (ARM® Cortex®-M4F × 6 cores), with a clock speed of 156 MHz. Now, lets start with the project. This are the main parts required for the project. Now to start with this project, we first need to setup our Arduino IDE so that we can program our Spresense board through it. Now, after this is is done, you are ready to code. Note : To run this example, you need to first run the mp3_dec_installer in the dsp_installer option of Audio examples, as the player example plays a mp3 file placed in your SD Card. Now, before writing the final code, lets have a look at the ultrasonic sensor code for the Arduino. This simple code gets the Ultrasonic Data in centimeters and prints it on Serial Monitor. 1. Create 3 audio mp3 files with the sentences shown in the above task. After that, store them in the root storage of your SD Card (assuming you have the mp3_dec in the BIN Folder), so that you can access them via code. After that, create objects for sdcard and audio to access its functions during our program. Now, that this functionality is done, lets move to the GPS part of the project. 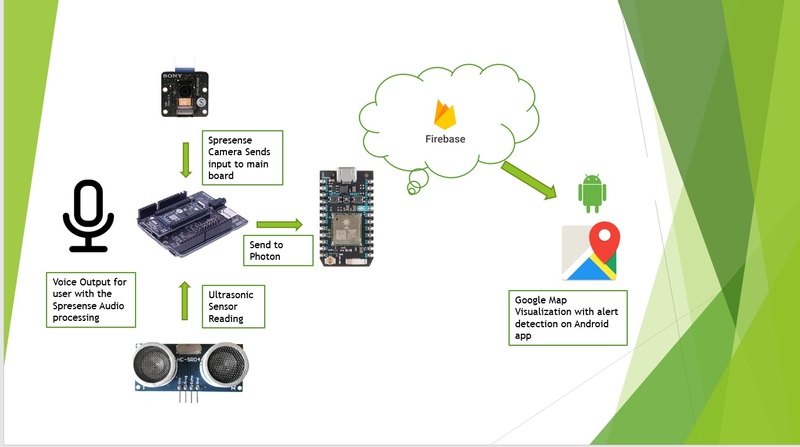 One of the most exciting features of the Sony Spresense board is the on-chip GPS, which makes it a far more superior board then its competitors. The best part is that its coding part is very easy, thanks to Sony for creating a dedicated library for the same. That tiny thing is a GPS Antenna!! So, to study this, we will use the gnss.ino example as it is as it provides all the information we need. Now, in my final code I have clubbed both these features into a single code. The code is attached below. Please comment if you have any doubt. Now, to the next step, that is to send this data to the Particle Photon. For simplicity, I have used the most simple UART method for serial data transfer. To do this, I referred this Awesome Tutorial by rickkas7. Now here are the codes for Arduino and Photon respectively. Now, simply implement this concept in your final code. In my code, I opened the serial(115200) for my connection and serial1 port for USB serial connection. So, now we are done with the coding part. Now that we have the data we need, we will be pushing this data to a Firebase Real time Database, so that we can access it later or for our Android App. Due to time constraint, I will be using a Blynk App for this project. But, here I am showing how to setup the firebase and integrate it with Photon. So, now we will be creating a similar Webhook to connect our Firebase Database to our Particle Photon. You will see the sign in option as shown in the figure below, from which you sign into your google account and then go to the Console using the Go to Console option shown in the image below. Once done, you will be redirected to project homepage. Now, go to Develop > Database and create a real-time Database. Add the fields and shown in the above picture for this project, or you can add your own fields too if you have some knowledge or have previously worked with firebase. However, for this project, due to a shortage of time, I will be creating a Blynk App. Due to Indian customs, I just received the boards a few days back. You can even see my project - UQM for android firebase Interface along with the source code. 1. Download the Blynk app from the play store. 2. Sign up to create a free account and start developing apps. 3. After that, create a new project and the choose the particle photon under boards section and the WiFi option and hit create. This is how the whole system operates. You have live location on the app, SOS Notification and also for some additional information, I also added the Ultrasonic results to the app too. Note: Please keep in mind that the actual Hardware has an Audio out in the form of a 3.5 mm Audio Out, so the Blind Person will have voice data access continuously, that app is just for monitoring purpose. So, after combining all the above parts and assembling all the parts together, I got all of this into a custom made Cardboard box( made by me :) ), these are the final images of my system. 1 / 5 • The Final System, on my Awesome Hand!! So, this was all for the Hardware and the Software Part of the project. Now comes the fun part, the Video Showcase! This marks the end of this Project. For all the code, just follow on to the GitHub repository linked below. As you have seen, I also have mentioned the Sony spresense camera in the required things, but due to shortage of time, I couldn't get any time to look into the camera specifics, I could just take and carry on basic analysis on the image, like ISO settings, White Balance, etc. I would really like to apologize the contest organizers, who sent me the camera board, but due to time shortage, I couldn't include that feature on my project. But I will surely be posting a project related with Machine Learning on Spresense, so please guys! stay tuned. I would like to thank Sony and Hackster for organizing such a great contest, where in we could get the most out of the Sony Spresense series of Boards. Thank you for giving me a chance to showcase my skills and sending me the Hardware, which made this project possible.